Advance Auto Parts Monster Jam is coming to Cleveland! Monster Jam, an incredible family-friendly experience starring the biggest performers on four wheels: Monster Jam monster trucks! These twelve-feet-tall, ten-thousand-pound machines will bring you to your feet, racing and ripping up a custom-designed track full of obstacles to soar over - OR smash through. Monster Jam provides a massive night’s entertainment tailored perfectly for your family’s budget, and these colorful, larger-than-life beasts are sure to capture the hearts of both young and old! Want to learn more and interact with other fans? You can find Monster Jam on Facebook. Surprisingly, my daughter is a fan of Monster Jam. Well, at least of Grave Digger. A few weeks ago, as we were returning to routine at school, it was a show and tell day and the letter of the week was M. (At my daughter's daycare, to encourage learning, if they choose to participate in show and tell, it has to be something that starts with the letter of the week.) My daughter chose to bring in Minnie Mouse (see that two Ms). 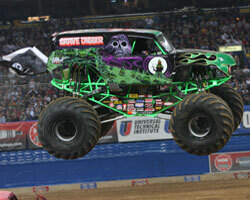 One of her friends brought in a Monster Truck, in this case, it was Grave Digger. Of course, when she saw that, she got very disappointed that she hadn't brought in her stuffed Grave Digger for show and tell. After that, she has had Grave Digger in bed many nights and has taken the stuffed truck for her movie buddy at school. I think that she will want to go, when she finds out that Monster Jam is coming to town. How about you and your family? This year, before two of the Advance Auto Parts Monster Jam shows, there will be a Pit Party. The fan-favorite Pit Party runs from 10:30am to 12:30pm on Saturday, Feb. 25, and on Sunday, Feb. 26 (prior to the 2:00pm shows). The pre-show pit party gives fans (with a pit pass and Sat/Sun 2pm show ticket) the chance to see the monster trucks up close, meet drivers, take pictures and get autographs. Pit passes will be available for $5 online at theQarena.com after tickets have been purchased and at the Quicken Loans Arena box office, while supplies last. Courtesy of Feld Family Entertainment, one A Busy Mom of Two reader will win a family four-pack of tickets to take their family to see the Advance Auto Parts Monster Jam Shows at Quicken Loans Arena. Giveaway will remain open through February 10th. Giveaway is open to residents of the US only. One winner will be selected through Rafflecopter. The winner will have 48 hours to respond or a new winner will be selected. No compensation was received for this post. As a Feld Family Blogger, my family is given the opportunity to see the show. The tickets for my family, the giveaway and the information about the show and discounts were provided by Feld Entertainment. All opinions expressed are my own or that of my family. I would LOVE to take my son and daughter. My friend took her kids last year and said it was a blast. Would love to take my hubby & son for the first time! My son loves monster trucks!